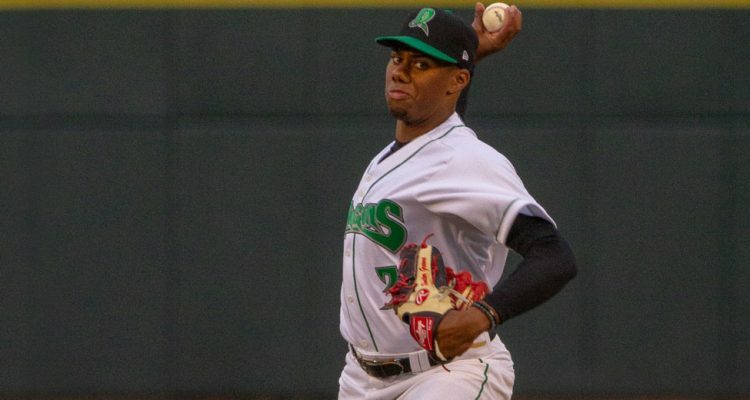 For the season Hunter Greene lowered his ERA to 4.73 on the season. That, as pointed out last week, is quite deceiving for how he’s performed overall on the year, though. Over his last nine starts, dating back to May 12th, Greene has made nine starts and posted a 2.68 ERA. That’s come in 43.2 innings pitched where he’s walked just nine batters and he’s struck out 49 batters. 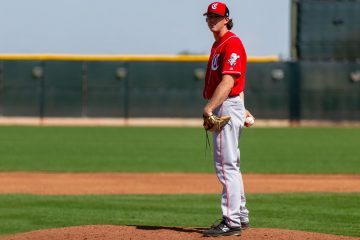 He’s been flat out dominating the Midwest League for the last six weeks and there’s no sign that he’s slowing down. Wednesday night saw the Louisville Bats offense explode in Columbus, and Dilson Herrera helped lead the way. The Bats second baseman crushed two home runs on the night. His first one went the opposite way, smacking the scoreboard in right-center. The second homer that he hit was pulled and was an absolute laser to left field. Things have been going very well for Dilson Herrera in Triple-A during the month of June. Over 21 games played he’s hitting .359/.457/.564 with 14 walks, seven doubles, and three home runs. That’s bumped his line for the season with Louisville to .306/.381/.475 in 44 games played. As noted above, the Bats offense went off on Wednesday night. Dilson Herrera wasn’t the only Louisville hitter with two home runs. Phillip Ervin also had two homers for the Bats on Wednesday night and both of them were huge. His first homer was a 2-run shot that turned a 1-run deficit into a 1-run lead. In his next at-bat he gave the Bats the lead again, this time breaking a tie with a solo homer. Not to be outdone, DJ Peterson only hit one home run – but it should probably have counted for two. Peterson hit a baseball to the moon in Columbus, estimated at 424 feet. It cleared the stands, deep into left-center field. SARMS are seriously powerful muscle gaining supplements, but if you’ve never taken them before, then you need to know that you’ll be taking a SARMs stack to the the rsults you want, but not all stacks are made the same. So read the latest SARMS stack reviews to get a firm understanding of what Selective Anrogen Reception Modulators can do for your muscle gaining conquests before making a single online purchase of SARMs. It had been five weeks since Hendrik Clementina had hit a home run before Wednesday night. The catcher leads the team with 11 home runs, but he had been in a bit of a slump when it comes to the long ball. It ended with a blast to left-center field. Outfielder Andy Sugilio has been absolutely on fire over the last five games. He’s gone 11-20 with multiple hits in each game. Wednesday night in Dayton he had three hits, including a 403 foot laser beam off of the netting beyond the concourse in right field. 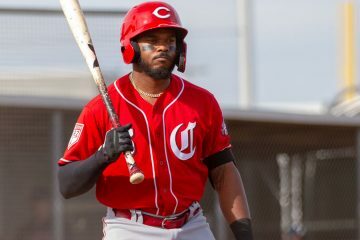 I know we had all been saying that Senzel was pressing the Reds FO to make a decision a call him up, but boy its starting to feel that was about Dilson Herrera now. Do the need to get him up sometime soonish so they can see what they have in him? If he can be any semblance of what he is looking like again he very well could be a starting caliber major league second baseman. He’s young, he can hit, he has some pop, and will be average defense hopefully. There’s some value there. Maybe the silver lining to Senzel getting hurt is it will open up the opportunity for Dilson to get called up and get a look at the show?? Agreed .. The “problem” of course is second base where Scooter resides .. Will the Reds actually give Herrera a look ? Otherwise the return on the Jay Bruce deal could be nothing . Herrera’s value at the beginning of the season was not too high as he passed through waivers before coming back to Louisville. As for Scooter, do they cash in on Scooter’s value (which is also not speculated to be be high ) while he is having a “mvp” season ? Are there no major league organizations looking for second basemen who can hit? There definitely are teams looking for help at 2B. It will just be a question of whether or not they are willing to pay what the Reds are going to ask for Scooter…. Why do you say Scooter’s trade value is not high? I would think it is very high. The Dodgers could really use him. The Braves need a 3B. Could Albies slid to 3B and put Scooter at 2B? The Braves have 10 SP included in fangraphs top 130. They should be looking for a trade because most of these pitchers will not make it to the majors as a Brave. Just no room. Cleveland has to be thinking Kipnis has seen better days. Atlanta: Scooter for 2 of their top 10 SP. Iglesias for 2 of their top 10 SP. Both of them for 3 of their top 5 SP prospects. I prefer the dodgers out of those options, depending on the return of pitchers from Atlanta of course. But if that Verdugo kid could stick in CF, boy would he potentially be an upgrade for us in CF. Stock, Atlanta would also need to include Pache in any trade for Scooter and/or Iglesias. Last year I wanted Drew Waters instead of Fairchild so I would love to see him as well in a big package. Which SP intrigues you the most with Atlanta? Can not understand when “Reds” have player that is leading the league in hitting, been a great player for 3 years, that people want to get rid of him. Does not make sense.They could trade him for 100 minor league league players and maybe not one would even reach the major leagues. I would really pursue Gohara. I wanted the Reds to draft Carter Stewart so I would like him also. I have no interest in Pache. It would cost them Gohara. And the Reds have plenty of CF in the minors that will arrive ahead of Pache. For both Gohara and Stewart we may have to offer one of Hughes/Hernandez and Scooter but that is fine with me. He’s getting older, he getting more expensive, if they can get value back for you try to capitalize on it. The Reds payroll dictates what they can and cant keep. Gennet unfortunately will probably not be around the nest time the Reds contend, so they have no reason to hold on to him now when his value is at an all time high. So the Mets are willing to listen to offers on Syndergaard and DeGrom. Syndergaard is controlled for a year longer and, in my opinion is what the Reds should be looking for in a top of the rotation addition. Obviously the price in prospects will be high, but that’s usually the case with young controllable established starters. What if the Reds offered Senzel? Who else would they have to add to make it worth it to the Mets? Would a Senzel, Long, and an additional young player be enough? Maybe Santillan instead as the second piece? Would the Mets be interested in getting Herrera back instead of Long? With Senzel as a starting point I think the teams could match up. It would allow the Reds to either extend or trade Gennett without considering where Senzel plays. Would alleviate our current 2B overlap situation (especially by potentially trading either Long or Herrera as well). It would add a top of the rotation veteran to pair with Disco. And there’s a good chance we can hang onto Greene, Trammell, T. Stephenson, and India with Senzel as the headliner. I for sure think the reds can compete next season and one of Mets big 2 is exactly what they need but I would not give up senzel for it. Or Greene or trammell. Those 3 all seem like multi time all stars to me. Let those guys bring the fans back and figure out how to keep em all as long as possible vs living in the moment. I do hope one or both get delt though. It would right the trade market. Going to cost a fortune for either one. I don’t think we’re getting an impact pitcher with at least 3 years of control without giving up one of Senzel, Greene, or Trammell. I don’t think they need one. Just get 5 guys that can pitch 5 innings of 2/3 run baseball and turn it over to the pen. Reds will win a ton of games that way. Reds got 5/6 really nice spots filled in their lineup right now counting Senzel. One good OF signing/trade or a player taking it to the next level like Peraza/ and they will put up one of the best lineups in baseball. I would be for this though- 3rd basemen are more valuable than 2nd and senzel is a 3rd baseman by trade and a luxury to the team. Send him to Atlanta for a slew of young pitchers with tons of control. Then you don’t give up all those years on the backend when you can’t keep DeGrom or Thor. I’m pretty sure the Reds have 5 guys that can consistently pitch 5 innings giving up 2-3 runs. That’s a low bar and if the Reds want to contend they’ll need more than that from their starting staff. That’s pretty much been the issue this season. You can’t consistently work your bullpen for 4 innings a night and expect good results. That plan is just sticking your finger in a dam hoping that’ll stop the water from coming through. I agree with you for the most part, but there are times you have to supplement your young home grown arms with an infusion of leadership and talent when the time is right. Consider the Astro’s addition of Verlander, or the Cubs addition of Chapman/Lester/everyone. You develop and grow internally yes, but then you take the areas of depth and deal them to supplement the areas of need when the timing and fit is right. I’m also all in on Kuechel and/or Gonzalez in free agency. Their cost in real dollars is less than the opportunity cost of retaining the talent and depth in prospects that it would require to obtain a player like Latos or Marshall or Choo. That kind of gutting of the system is why we are in a historic low point in the franchise. Pay now or pay later. The Reds ought to pay now and horde talent like crazy. I think a 6/120 would do it for either one of them. I know it is easy spend Bob’s money, but It would help turn the team around. Adding up the value of Didi, Grandal, Alonso, Wood, Boxberger, even Volquez, the lost value was too high for the Reds to sustain. Those players were mostly a result of drafting early due to the bad years. Here we are again, accumulating great players from losing, its the best currency we have. Do not gut! Keep players. Slow walk their promotions. Develop great players ready to perform on call up. Trade redundant and costly vets who perform well. Replenish farm at all times. I remember Latos being pretty good in 2012-13 and helping the Reds win over 90 games and make the playoffs both years. Seems like it worked out well the last time. Latos and Marshall were great. Choo was great. They cost a fortune in salary and talent. Adding a healthy FA like CJ Wilson would have provided greater return on the money than the Latos trade. Whatever the financial constraints were back then, they do not exist now after the rebuild and tv deal. Play big by keeping your prospects and buying the right talent. Mets pitching has trouble with health. Wouldn’t want to trade any top 5 system talent at all. None. As far as overlap in the system, it hasn’t caused any problem yet. It’s only creating greater flexibility. I think a guy of this caliber would make all the difference, but if we are going to give up that kind of talent we better be getting a pitcher under team control for at least 3+ years. To give up 6+ years of at least 1 all star, if not more, better come with some years of service on the pitcher we get back. Something around what they got with Latos would be good. I know Latos is a head case now, but he had some good years for the Reds before they traded him, and he was under control for several years when they traded for him. Someone like this is what they need IMHO. If the Reds traded for Syndergaard this trade deadline, they would control him for 3+ years. He’s a Super 2, so he’s got three more years of ARB left after this one. One of the reasons I think he’s a good target, he’s a top of rotation starter who’s controlled through 2021. I would trade Senzel for Syndergaard in a heart beat, I’m sure it would cost more than just Senzel though, if the Reds could get it done without having to include Trammell or Greene I would probably go for it. Maybe Senzel, Long and Robert Stephenson seeing he’s never gonna get a fair shake in Cincy anyway, I think that would certainly keep the Mets on the line. I would trade for DeGrom over Syndergaard due to health. A great player on the DL isn’t helpful as a very good player who is healthy. I wouldn’t trade Senzel or Trammell, but I think that’s the only two I would keep off limits as far as prospects go. I would gladly Green for DeGrom, even adding Shed Long to the deal if the pot needed sweetened. 2 years of Arb, 3 years of FA.. $12m, $15m, $17m, $17m, $19m? Call it 5yr/$80m? Maybe add a $25m/$5m 6th year option/buyout? I would have to think it’d be hard for him to turn that down. So yeah, I would 100% be in on Green+Long+(maybe a tier 2/3 lottery-type prospect?) for DeGrom if you could plan on instantly extending him. While I think the Mets would entertain that trade Degrom would not entertain that extension. He will clear 20 Mil AAV on the open market easily, even if it is just a 3 year deal. I would bet more like 25 AAV, I think Arrieta’s deal is a great comp for him. I don’t think Arrieta’s deal is a good comp at all. DeGrom is still under team control for 2 more years after this year, so 2.5 years of team control (hence the lower $ the first two years). Arrieta was a FA, and a year younger than what DeGrom will be when he eventually reaches FA. DeGrom would have to balance guaranteed security versus potential. A lot can happen in 2.5 years to a pitcher. Just look at Mat Latos, or heck, former DeGrom teammate Matt Harvey. Both aren’t going to hurt for money compared to a normal person, but neither made it to FA to get their monster paydays, and now neither are likely to ever have it. DeGrom would have to weigh betting on himself being both healthy AND effective for the next 2.5 years, and then hoping FA would be kind to a pitcher heading into his age 33 season… versus being assured $80-85m+ guaranteed. Sure it might lower his possible earnings ceiling, but it VASTLY raises his earnings floor. Maybe I lowballed it and a couple million more could be added on, but I don’t see it going anywhere near the $23m/yr Arrieta got, simply because of the 2 more remaining years of team control. Makes a pretty good argument for why the Reds shouldn’t offer the extension as well as why Degrom would/should take it. Degrom has been relatively healthy and better/more consistent than Arrieta, like you said a lot can happen in 2.5 years but if he keeps this up and enters free agency at the same age as Arrieta 3 years later he will shatter Arrieta’s AAV. You want Degrom to entertain a 5 year deal this offseason you gotta come 20 AAV at minimum. Can’t forget Degrom knows well that even if he stays effective and healthy that will be the last big deal he gets, he will have to play out his career on 1 year deals after that extension. I hope he works on developing a change-up because he will need it later. Now is the time to use it. Any chance Greene follows jose fernandez patch to The Majors and makes it in 2 years when he’s 20? I have my doubts the Reds will push him that fast. For that to happen Greene will probably need to be called up to High A the second half of this year, and it sounds like the plan is to keep him at low A all year. That would leave him 3 levels to cross next year, and that seems just like too much of a jump. But I would love to see the Reds push the kid and promote him. If he is blowing away A ball hitters and needs a better challenge lets give it to him. The window to compete is a year or so away. Time is short! Yeah – I would be interested in seeing how Greene compares to past under 20 year minor leaguers…. I looked to see how some of the stars did as 18 year old’s. The ones who came from college obviously never played in the minors before their 20th birthday. Bumgarner, Kershaw and Syndergaard all came from HS and all had notable innings as an 18 year old (CK 37 IP 13.14 K/9 and 1.22 BB/9 in Rookie ball. NS 32 IP in rookie ball had 10.41/3.09, MB 141 IP 10.42/1.33 in A ball). Greene K/9 and BB/9 are right with their age 19 season though (CK 12.39/4.62 in A ball. 12.58/6.20 in 5 AA starts. NS 10.33/2.33 split between A- and A ball, MB 8.51/1.48 in 5 A+ starts and 5.80/2.52 in 20 AA starts He was 9-1 with a 1.93 ERA in AA so he was still very good). Greene is at 11.31/3.21 as an 18 year old in A ball. Only Bumgarner played A ball as an 18 year old. Regardless this is pretty good company. I agree. He’s probably going to get shut down in Dayton before the end of the year and based on the way the Reds have traditionally handled teen prospects, I’d expect he’ll be in Daytona all next season. I think it’s probably a sound decision. I’d think May 2021 is likely to be the earliest he’s with the Reds. Add to those three Shed Long as well. One or two of these guys needs to be moved to a position of need for the Reds or they need to start trading them to help those positions of need. CF, SS, SP. Rinse and repeat. Just need to keep going after guys that can help those positions till you get the right ones. Everywhere else is pretty well set and ready to compete! Things are starting to feel like they did right before the Reds got competitive last time. They traded for Rolen at the end of a losing season, but he changed everything going into the next year. After him a few other pieces fell into place and everything just clicked. That’s the kinda trade the Reds need in the second half of this year. Some kind of opportunistic trade that sets the team up to turn a current weakness into a strength for years to come. SS, CF, SP. Rinse, Repeat! Depth is a fleeting thing. Keep all the prospects you can until they fail or run out of time. Better to have more talent than less. Better your prospects are well ready (Frazier, Votto) rather than too early (Bruce, Cueto). Point taken Tom, but your prospects can’t fail if not given an opportunity at the next level once they succeed in the current one. That is exactly the situation staring the Reds in the face. They have a glut of talent at 2B, some of which seemed locked at 2B. Something has to give. Either the Reds can find places for these guys at the major league level, or they need to turn these assets into other assets that can actually benefit the major league ball club. They don’t need 4 legit starting options at 2B (Scooter, Senzel, Herrera, Long). Some either need a position change and/or need to be traded. This has got to be a better alternative than letting good assets that are ready for the major leagues rot in AAA. Easy first step is trade Scooter. Then Senzel and Herrara who are both injury prone, get shots. 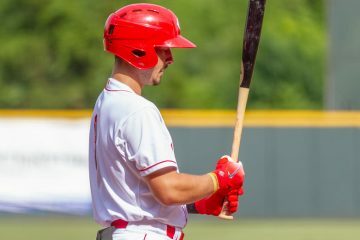 Honestly, Senzel in aaa until September 2019 is just fine for the Reds. He has options. He can work in consistency. Positional flexibility. Etc. Herrera doing well makes it all worth while. He is out of time and can now get his shot. While it seems necessary for order to start moving pieces, it really isn’t. Long has 2-3 years left in the minors. Not a forcing function. Using options on quality prospects is a market advantage. Players and fans won’t love it but they will love winning over a longer window. You can always acquire a hot guy down the stretch like Royals acquiring Cueto. KC didn’t have a true ace- just a lights out pen. Pick 2/3 starters out of current group and go sign 2 FA pitchers that can give you 5 decent innings most nights. 2 of those names to the mix and reds contend next year while competition soars in Louisville. Didnt realize Richards Was a free agent after this season, He is a guy i like but has an injury history. If the injury history lowers his price i think i like him the most out of this group. Lance lynn is having a rough year so id like him as well if the price is right. Sabathia, happ and liriano are to far past their prim for me. Keuchel and Gio will cost to much for us and charlie morton is a strange one having an amazing season, But will he continue with this success? How nice would it be if the national league had a Dh and people got past tradition and got with the times. If the world lived by tradition and no change, this world and the human race would be in a big mess and in huge trouble. Just saying. Yes, i am in big favor of the DH. I want the best players playing baseball. I want more jobs opened up and created. I care nothing about tradition. I live today, not in the past. I see tradition as nothing but a hindrance of slowing down and keeping the human race from evolving, yes even with baseball. I want to see better baseball. I want to see a guy like David Ortiz up and hitting instead of a pitcher, who really don’t get practise throughout the minors because the only concern that teams have is developing him as a pitcher and he only gets to hit on the day he is pitching because of the 5 man rotation. If the national league cared about tradition then why don’t they let the pitcher hit in interleague games being played in the American league ballpark, because they don’t want to be at a disadvantage right. Well there goes your precious tradition. It doesn’t seem to matter there. Everything just screams DH to me for better and even more exciting baseball, instead of saying no i don’t want nothing to change just to be saying it and calling it tradition. While i am at it and ranting, Another what we call tradition, i would like to see broken is the fan participation in the All-Star voting. I find this just as comical. Think of the players not getting in because of this that should be in. Players not getting a bump in salary because they didn’t make the all- star team thanks to the voting of fans to players taking up roster spots that don’t deserve to be in. Yes, i know it gets the fans interested and involved, but it doesn’t put the fans in the seats. But anyway i am done with that. Just a reminder to everyone, we are all different. Let’s keep it civil. NO belittling someone or talking down to them. I disagree. I enjoy watching NL ball much more than the AL. HOWEVER, I’d like to see both leagues finally do the same thing again. So if they have to add the DH, I’m fine with it or if the AL switched by to P hitting. I agree Donny Boy, DH does need to happen in NL. People say changes need to happen yet cry when people bring up NL DH. It isn’t fun when runners are in scoring position and they walk the 8 batter to get to the pitcher. Also, 3+ pitching changes in an inning is one that drags the game on. This shouldn’t be a gentleman’s game. Young adults/teens love to see the bat flip and then some and not expect a fastball high and in. If it happens, so be it. NL baseball is more interesting then AL. Correct. American League Baseball is boring. Suarez has to be by far the most valuable player/contract on either team. They won’t sniff a player of his caliber with either player…so I offer up Suarez for Degrom and Syndergaard. Throw in a couple of 6-10 guys. You have instantly taken the rotation from a weak point to a massive strength. With Herrera, Senzel, Scooter, and Long, 2nd and 3rd don’t become holes. Bullpen remains a strength. Offense isn’t changed drastically as you replace Suarez with Senzel. This could make a world series team in 2019. Colt, I think you are right about Suarez and with his great contract, the Mets would have to consider it. Suarez is flat out the second best third baseman in the NL and among the top 5 to 10 players overall when you combine his complete game. While I do not want him in a different uniform, as he’s my favorite Red, the fact that Senzel will be ready to step in next year, the idea of maximizing there assets, has great logic. It would be bittersweet, but pitching would get the Reds over the top right now. I believe it was Wes that said that Hunter was exceeding expectations. Not sure that’s the case. Many believed he was well prepared to succeed. I get your point Wes, but every time he stumbled the minions want to cast doubt on the hype. The freaking kid is 18 and he’s showing just how gifted he is. Oh and yeah, when many were bashing the Reds last season for holding him back. That certainly has not hurt him. I like Colt’s idea of getting both. But instead of Senzel for 7 years of control i would rather have Suarez for 7 years. Less injury risk and more certainty. DeGrom and Syndergaard for Senzel, Herrera, Santillan, Fairchild, Siri/Friedl and Clementina. As was said suddenly the Reds have great SP (especially if they pursue Keuchel this winter). I disagree Joe. Thanks to his contract Yelich was going to easily get a better return than either of these to injury plagued pitchers. Yelich has 5 years and these two have a combined 5 years of control. Will 5 years of control from 2 injury plagued pitchers cost more than 5 years of control of Yelich? I say yes but not markedly so. Senzel >>>>> Brinson. In fact I would go so far to say Senzel > Brinson + everyone else in that trade. I didn’t understand the high ranking of Harrison last winter and his 35% K% this year doesn’t change my opinion (I also felt Brinson was not the prospect he was ranked at because of his K problem). I would also say that when you consider injury history and contract that Yelich > DeGrom and Yelich > Syndergaard. Herrera may be under-rated by this site even though Doug does his best to sing his praises. I think he would be a top 50 prospect if he were eligible for prospect lists. I personally felt throwing in Santillan was too much. Senzel >>> DeGrom and Senzel >>> Syndergaard. If anyone hangs up the phone with this offer it is the Reds, not the Mets. Mets will get a better package than that for either guy. Suarez is good but not elite and no where near the caliber of player of either guy. Let alone both. There’s more money than talent in mlb and mets have plenty of both. Suarez contract isn’t that inticing to a major market team like Mets. Atlanta and dodgers will make a stronger offer than that for either guy centering around mlb starting pitching if they choose too. If Mets don’t get the offer they want- they can just keep em. And unlike the reds- Mets can afford to resign both pitchers if they choose too. They are just doing the right thing by throwing their names out there. Value is certainly subject to the recipient, and we appear to disagree on Suarez. I would be shocked if Suarez is not listed in the Top 50 Trade Value series that Fangraphs prepares, and I would be equally surprised if a trade of either pitcher (individually) would get a player from that list in return. The fan graphs list is not a perfect science, but gives at least some context. My proposal would condense Reds player value to the near term for a Joey Votto window and extend the value for the Met’s beyond the next 2/3 years (while transitioning assets from the Mound to the offense). I think Colt Holt is on target here. He is absolutely correct. And just because the Mets have money does not mean they do not place a value on a great contract. To say they don’t is just silly. Good idea Colt. But again if we do this we are thinking short term so I would rather part ways with Senzel rather than Suarez. I’m a Suarez believer and I think Suarez had one of best contracts in all of baseball and is performing at a level other guys I prefer may never. But I’ll still take 2 pitchers out of Atlanta’s system and Walter Buehler over him in half a heart beat. Not even close and both those teams can justify adding a guy for that price. No chance Suarez can fetch either one when u compare it to what other teams will offer. And if they don’t offer- I would keep em both before I would give up one for a Suarez headlined trade. I don’t believe the Reds can afford the kind of path that the wealthy teams take. I believe they need a model in which they develop internally, keep talent in house, occasionally tie up good players, as they did with Suarez, and replenish from in house as players bolt for free agency. Bailey is Exhibit A arguing against big contracts for pitchers. Teams willing to trade supposed pitching studs, especially wealthy teams, do so for a reason, and that reason is seldom a magnanimous gesture to a small market team. I don’t like the DH and just as daylight savings time does not create additional daylight, the DH does not create jobs. There are still 25 players on the major league roster, and still 40 on the team roster. In my opinion, it makes high income jobs for players who are not complete baseball players. Defense is part of the game, a part these guys can’t play well enough to hold a spot, yet they stifle positions for ip and coming young players. I live in Houston and won’t go to an Astros game even if my beloved Reds are playing here. I abjor the DH. With all the complaining about Senzel not being promoted sooner, were there a highly paid DH with the Reds, there would be one less spot for Senzel, or Herrera, or any other top prospect. I would not trade Hunter Greene. 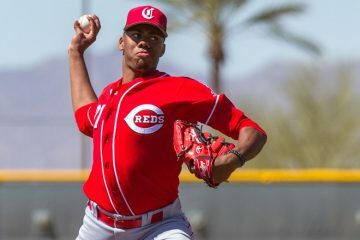 He has the potential to be great; I’d rather he be great in a Reds uniform for six years, than a DeGrom or Syndegaard be great in a Reds uniform for one year. Degrom is 2 years of control and NS is 3 years. If they were both rentals, I wouldn’t have proposed Suarez as the centerpiece. The Reds are a small market team. The way small market teams complete is through their farm system. When a player reaches free agency you trade him and bring another player up. If you need to make a trade you do from the major league team or through duplicate good minor league players (like the reds 2nd base position now). You might have 2-3 players past their free agent years (Votto, Suarez, or friendly home town discounts). Management should not feel the pressure to go all in, selling the farm for 1 possible good year. Lets get good and then stay good and know you can’t act like a big market team. I think you can trade Senzel, Herrera, Clementina, Fairchild, one of Friedl/Siri and be great now and later. 1. Extend Scooter and keep him under contract for at least 5 years. I think that is a team that compete for the next 5-7 years and I am not including India, Downs, Long and others. I am really depending upon either Siri/Friedl/Trammel to be a stud in CF. I am hoping Peraza has taken a huge step forward this month. I am hoping Castillo figures out what he no longer knows. And we want to avoid injuries. I would also love to sign Keuchel and send Castillo to the pen where he would be lights out. A rotation of DeGrom/Syndergaard/Keuchel/Disco/Mahle would be one of the best in the league if not the best. If reds make any Trades I hope do not Trade Siri or Trammell. We can see how having a Hamilton like Defender in CF really helps and that is Siri. If you have 2 Corner OF that can Hit that makes the outfield Very good. Trammell can play RF like schebler does with range not his arm or LF if best Fit. I get that Siri going to turn 23 already but he has only 31 games total above A ball. He could easily improve his Flaws at hitting also can Improve his already very good defense. *36 games for Siri above A ball sorry. True i feel like Siri value higher to Reds than to other Clubs. Siri is the only one so Far who has shown that he is a true CF. The Other OF Prospects have to Hit to have good Value. If you look at the needs of contenders the Phillies have shown themselves to be all in and Gennet and Herrera would be a Phillies upgrade for either. Five years from now Votto will be 38-39, Gennett 34-35. Not sure either of them will be “very good” by then. Cannot, in my opinion, assume that current production continues unabated into mid to late 30s. I believe I have read that Votto is not hitting with as much power as he did a few years ago, even Votto himself having said so. Will Gennett similarly decline by the age Votto is now? What will be will be. I hope it will be the process RedsinWashst outlines but my job is not on the line either way. Seems more sustainable over time for a small market team. Either route has risks. Another Bailey is a big hit to the process. Another Howard/Travieso draft is a big hit to the process. DeGrom and Syndegaard both have been on DL this year already and I still wonder why a wealthy, big market team would give them up. Last I knew, the Mets were not a charitable institution. Even if the Reds got both, who says they stay after their control years are done. That could put a kink in the five year plan. it is good to hear there was no damage to the tendon in the finger of Senzel. surgery was performed today and was a Success. Nice peraza showing some Power.